Luton Town got their first home win of the season in League Two as they edged past Mansfield at Kenilworth Road. 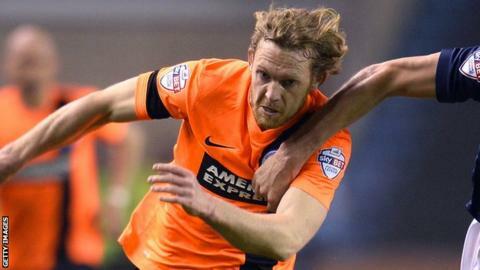 Craig Mackail-Smith's penalty was enough for the Hatters as they moved up to 18th place in the division. The former Brighton striker made no mistake from the spot after he was brought down by Ryan Tafazolli following a pass from Paddy McCourt. It was vindication for Mackail-Smith, after he had a stunning overhead kick disallowed in the first half. Match ends, Luton Town 1, Mansfield Town 0. Second Half ends, Luton Town 1, Mansfield Town 0. Substitution, Luton Town. Alex Lawless replaces Paddy McCourt. Craig Mackail-Smith (Luton Town) wins a free kick in the defensive half. Corner, Mansfield Town. Conceded by Olly Lee. Corner, Mansfield Town. Conceded by Stephen O'Donnell. Substitution, Luton Town. Mark O'Brien replaces Cameron McGeehan because of an injury. Attempt saved. Craig Westcarr (Mansfield Town) left footed shot from outside the box is saved in the bottom right corner. Substitution, Luton Town. Danny Green replaces Josh McQuoid. Attempt missed. Craig Westcarr (Mansfield Town) header from the centre of the box is close, but misses to the right. Substitution, Mansfield Town. Adi Yussuf replaces Mitch Rose. Attempt missed. Cameron McGeehan (Luton Town) header from very close range is close, but misses to the right. Attempt saved. Jack Thomas (Mansfield Town) right footed shot from outside the box is saved in the centre of the goal. Corner, Mansfield Town. Conceded by Josh McQuoid. Corner, Mansfield Town. Conceded by Mark Tyler. Attempt saved. Jack Thomas (Mansfield Town) right footed shot from outside the box is saved in the top left corner. Attempt missed. Luke Wilkinson (Luton Town) right footed shot from the centre of the box is too high. Corner, Luton Town. Conceded by Adam Chapman. Attempt saved. Mitch Rose (Mansfield Town) right footed shot from the right side of the box is saved in the bottom right corner. Goal! Luton Town 1, Mansfield Town 0. Craig Mackail-Smith (Luton Town) converts the penalty with a right footed shot to the centre of the goal. Ryan Tafazolli (Mansfield Town) is shown the yellow card for a bad foul. Penalty Luton Town. Craig Mackail-Smith draws a foul in the penalty area. Penalty conceded by Ryan Tafazolli (Mansfield Town) after a foul in the penalty area. Substitution, Mansfield Town. Reggie Lambe replaces Nathan Thomas. Attempt saved. Craig Westcarr (Mansfield Town) right footed shot from the right side of the box is saved in the bottom left corner. Corner, Luton Town. Conceded by Krystian Pearce. Corner, Luton Town. Conceded by Malvind Benning. Corner, Luton Town. Conceded by Ryan Tafazolli.